While we have served our mission well, honoring those students and industry professionals who have achieved this status, the Association has also worked tirelessly to get new students into engineering, provide financial support to those completing undergraduate degrees, and encourage study at master's and doctorate levels. While not mandated in our governing documents, our leaders envisioned a higher purpose in our work and have approved programs over the years to meet the needs and changing environment of the engineering profession. All of us at Tau Beta Pi are proud that our members are among the most recognized and successful leaders in the engineering and business communities. Our alumni are the founders, innovators, and senior executives of a multitude of enterprises and the accomplishments of members such as Andy Grove, Jeff Bezos, Jack Kilby, David Packard, Buzz Aldrin, and many others inspire us all. Tau Beta Pi seeks to ensure that the next generation of engineering leaders also have the opportunity to benefit from their membership in Tau Beta Pi—to enjoy the learning, camaraderie, service, and recognition that serves as the springboard to their future success. We are asking our alumni to participate in securing that opportunity for the outstanding engineers of the next decades through a unique connection between our alumni and our chapters. Tau Beta Pi has recently created a new program, the Chapter Endowment Initiative, by which alumni, companies, and foundations can permanently endow the Association's activities that support any of our 246 student chapters. Tau Beta Pi has always been a lean operation and we currently have only 13 staff members whose efforts are supplemented by over 100 dedicated volunteer Association Officials. On the local level, over 2,000 students and alumni offer their time to provide leadership to the collegiate chapters. As we look toward the next decade, we want to continue to offer the same benefits we do now and also bring on value-added programs for our members in the future. To do this, Tau Beta Pi will need additional resources. That is the purpose of the Chapter Endowment Initiative. See the case statement here. 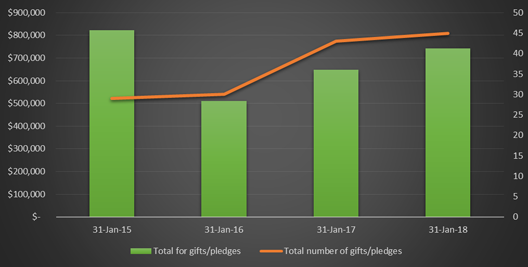 Gifts & pledges reported: in 2017, 43; in 2018, 45; and in 2019, 38, to add to the list as we strive to endow all of our collegiate chapters. While our current financial situation is stable and the total amount of alumni giving is up, we are noticing that our older, more consistent donors are passing on and the students taking their place today are unable to give as generously as they are saddled with considerable debt burdens resulting from the cost of their education. The resulting trend is a fewer number of gifts but, fortunately, larger average gifts. While things are going well because we're bringing in more money each year, a trend of decreasing number of gifts is not sustainable over the long run. Our preference is not to pass on costs to the students as many universities have made a standard practice of tuition hikes. Tau Beta Pi feels that our students should continue to pay an initiation fee so that they value their association with us, but to increase it significantly would be prohibitive to many students. We strive to recognize achievement of all students, not just those with financial resources. Based on input from our alumni and students, and in an effort to better serve them, we have been adding programs for the last forty years (District, Engineering Futures, MindSET) with no permanent source of revenue for these programs. Annual alumni giving has provided the bulk of support, but no major campaign to provide lasting support was conducted. Our plan is to increase our endowment so we can continue to provide the professional development experiences and leadership training for the future engineering leaders of our society as well as give out more scholarships. We hope you will consider joining in this effort as we seek to raise $25 million over the next 10 years. All individual email addresses on Tau Beta Pi national or chapter websites are exclusively for use in the conduct of Tau Beta Pi related business. Any other use, including recruiting and marketing, is strictly prohibited.